Scientists say they have found the first evidence that giant sea reptiles - which lived at the same time as dinosaurs - gave birth to live young rather than laying eggs. They say a 78 million-year-old fossil of a pregnant plesiosaur suggests they gave birth to single, large young. Writing in Science, they say this also suggests a degree of parental care. 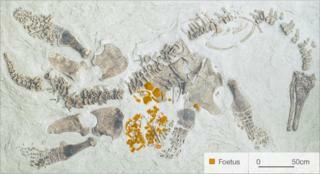 The fossil, the first of a pregnant plesiosaur found, is at the US Natural History Museum of Los Angeles County. After being excavated from a ranch in Kansas, US, the 5m-long fossil skeleton Polycotylus latippinus lay for two decades in the basement of the Los Angeles museum waiting to be chiselled from its rocky casing. Two years ago when researchers began to piece the bones together they quickly realised that they were in fact dealing with two separate animals; an adult plesiosaur and a smaller juvenile. The study's authors report that the juvenile was unlikely to have been eaten by the larger reptile because its tiny bones showed no evidence of bite marks, and its soft, immature skeleton suggested an animal only two-thirds of the way through its development. For more than 200 years palaeontologists have speculated about how these colossal Cretaceous animals reproduced. Many believed the plesiosaur was too cumbersome to drag itself up the beach to lay eggs, and so must have given birth to live young. "[The find] provides the first direct evidence for live birth in plesiosaur," said palaeontologist Adam Smith from the Thinktank Centre, Birmingham Science Museum, UK. "It's a very interesting find...[and] has been a long time coming." "The lack of fossil evidence of a pregnant plesiosaur was frustrating," explained the study's lead author Frank O'Keefe, from Marshall University in Huntington, US. But he added: "What is really surprising about this fossil [is] that plesiosaurs [reproduce] differently to other marine reptiles... they give birth to one big baby instead of a lot of little babies." By making comparisons with modern animals, such as whales, which give birth to larger, single young and then go on to care for them, Dr O'Keefe and his colleague, Luis Chiappe from the museum, attempt to infer something about plesiosaur behaviour. In a similar way to land-dwelling dinosaurs, which are thought to have provided food for their nest-bound young, plesiosaurs, the authors suggest, might have been doting parents. But Dr Smith was less convinced. He said that it was "certainly quite possible... but is very speculative". P. latippinus's close relatives had three young at one time. It is possible the P. latippinus evolved to have only one, and care for it, he told BBC News, but more pregnant specimens are needed to be more certain of this. Dr O'Keefe agreed, explaining that unlike on land where nests are preserved, studying the behaviour of ancient marine creatures is very difficult. "When you get right down to it, behaviour doesn't fossilise, so we are stuck trying to make these inferences using modern animals where we can observe their behaviour," he explained.